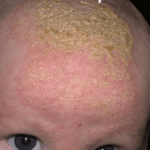 1 What is Facet Arthropathy? 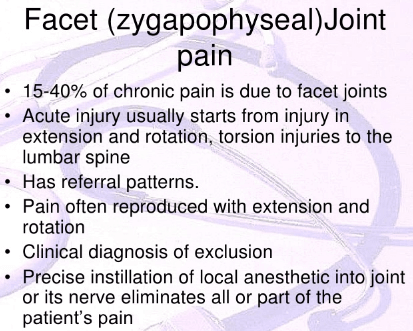 2 What are Facet Joints? 4 Who Can Develop Facet Arthropathy? Facet arthropathy is a degenerative form of arthritis, which affects the facet joints of the spinal cord and can be a significant source of pain around the neck and back. At the posterior of the spine you will find facet joints. The human spine consists of 24 vertebrae just above the tail bone, also known as the sacrum, between each of these vertebrae of the spinal column you will find two of these facet joints. The facet joints and the intervertebral disc form a three-joint complex between each of the adjacent vertebrae. A facet joint has two bony surfaces that have cartilage between them and a capsule of ligaments surrounding it. There is synovial fluid to lubricate these joints just like in other joints found in the body such as the knee. The facet joints are important because it is these joints that help maintain the normal alignment of the vertebrae as well as limit the motion of the vertebrae. Obesity and poor posture can also affect how the facet joints align and move. These circumstances affecting facet joints cause additional stress, which may lead to the formation of bone spurs, also known as osteophytes, which may lead to further deterioration of cartilage. Other than the causes of facet arthropathy, which have been mentioned above, it is important to know that this is a condition of aging associated with spinal degeneration, which occurs later in life. It is common between the ages between 40 and 70 and especially prone among those who have arthritis or a previous back injury. Lower back pain is the most common complaint by patients. This pain however does not radiate down the legs and buttocks unless it also involves spinal stenosis, which is the abnormal narrowing of the spinal canal along some regions of the spine. Pain can also be felt in the neck, especially around the shoulders and the base of the skull. Facet arthropathy mainly involves pain at the facet, which is quite similar to other conditions that affect the spine. Therefore, a proper diagnosis is needed to determine whether the facet joint is the main cause of that pain. Medical history will entail considering all the information provided such as previous injury, location of the pain, problems standing or sleeping. Physical exam will involve the patient being asked to stand or move in different directions and pointing at the places where they feel pain. Resonance imaging (MRI) to check for spinal problems. Another more direct procedure is where a guided injection is performed using a fluoroscope (an instrument with a fluorescent screen for viewing X-ray images without taking and developing X-ray photographs). Here medicine (local anesthetic and corticosteroid medication) and a dye are injected at the facet joint where pain has been pointed to by the patient. The dye is used to allow viewing of the placement of the needle and injection. If the facet joint is injected and pain is relieved from that facet joint then this proves the diagnosis of facet arthropathy. Pain relief is however not immediately felt and analysis is done for periods of 20 to 30 minutes after injection for a period of one week. Heat wraps, hot water bottles or hot showers, or cold pad applications may help reduce painful episodes. Sinu- a form of vertebral nerve ablation, which destroys the nerves using an electric current. Facet rhizotomy – this is the severance of one of the nerves going to the facet joint. Fusion – here the facet joint is removed completely and the vertebrae, which can be two or more, are fused and therefore eliminate movement of the facet joints. Although facet arthropathy cannot be reversed there is evidence to suggest that proper exercising, life style changes and careful management of pain can contribute to a better quality of life. Proper posture and alignment of the spine are also important in alleviating pain as well as losing weight to reduce pressure on the facet joint. While a proper posture, maintaining proper weight and exercises can help alleviate pain, they can also help prevent facet arthropathy by delaying the degenerative process. However it is important to consult a physical therapist on which forms of exercising are appropriate in strengthening the spinal column.